WARNING: THIS VIDEO IS VERY GRAPHIC AND MAY NOT BE SUITABLE FOR ALL AGES. BY CLICKING THE VIDEO ON YOU AGREE THAT YOU ARE 18 YEARS OR OLDER. Police who arrived at the scene shot and killed one of the animals, leaving friends to rescue a bleeding Wayne “Wayntjie” Kayster. Kayster was rushed to hospital, but died later on Monday night. Some residents in Lotus River claim Kayster was a known thief, who had been trying to break into the house in First Avenue while the owners were away. However, his distraught family says the 35-year-old drug addict was merely looking for scrap when the dogs attacked him and ripped out his throat. The eight-minute long video, taped by a resident, shows Kayster being bitten and mauled by TWO LARGE PIT BULLS. Bernadette Abraham, of The Cape of Good Hope SPCA, says they have viewed the footage and are looking into the incident. Police spokesperson Lieutenant Colonel Andrè Taut says an inquest docket has been opened for investigation. Another video has caused a stir on social media, this time showing a man being mauled by two pit-bulls. Police can also be seen intervening, shooting one of the animals before community members try to save the victim. The man being attacked is Wayne “Wayntjie” Kayster, an alleged thief believed to be trying to break into a house in First Avenue, Lotus River, Cape Town while the owners were away. The video shows Kayster being attacked by a white, pregnant pitbull and a brown male pitbull. The animals are relentless, regardless of the community trying to get the dogs off Kayster. At one point, one pitbull has Kayster by the throat. Bernadette Abraham, of The Cape of Good Hope SPCA, said that they have viewed the footage and are looking into the incident. Police spokesperson Lieutenant Colonel Andrè Taut said an inquest docket has been opened for investigation. 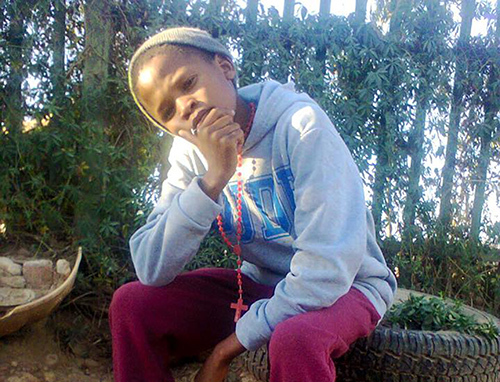 Kayster was rushed to hospital after the attack, but died later on Monday night. Kayster’s family, however, say that he was not commiting a crime at the time of the attack. They believe he was looking for scrap. Kayster’s shocked sister, Theresa Demas, 39, told the Daily Voice, “I was at the owner’s house [on Tuesday night] and he said Wayne was at his home looking for scrap, as he usually does. “He told Wayne there was nothing. “People say when Wayne was peeping over the wall, the dogs dragged him over. “Wayne has been (hustling) since he was at school and he is a drug addict. “It was just horrible what happened,” Demas said. The family want the other dog to be put down. The owners were not home and have not given comment. I'm sure Bernadette Abraham, of The Cape of Good Hope SPCA will view the footage and decide police prematurely shot one of these pit bulls dead. I'm sure she'll demand an investigation into why police didn't first try throwing treats, then try pepper spray, then a taser, then a catch pole, then let themselves be mauled next, and only then shoot (but not to kill). I'm also sure Bernadette Abraham, of The Cape of Good Hope SPCA will give the non-dead pit bull a 'behavior test' and decide it isn't dangerous. She'll try to rehome it to some family 'with only older children'.